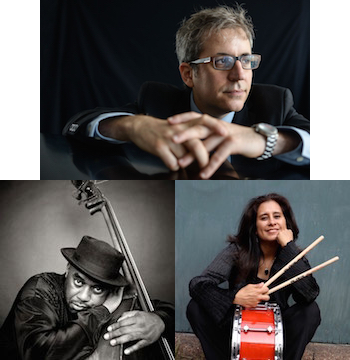 Former Bay Area pianist and now New York stalwart, Peter Zak joins forces with fellow New Yorkers, bassist Essiet Okon Essiet, and drummer Sylvia Cuenca (also a Bay Area transplant). They will be performing compositions and arrangements from Peter’s new album, “One Mind,” as well as material from his many acclaimed previous releases.Former Bay Area pianist and now New York stalwart, Peter Zak joins forces with fellow New Yorkers, bassist Essiet Okon Essiet, and drummer Sylvia Cuenca (also a Bay Area transplant). They will be performing compositions and arrangements from Peter’s new album, “One Mind,” as well as material from his many acclaimed previous releases. Jazz pianist and composer Peter Zak performs and records both as a sideman and leader of his own groups. His credits include George Coleman, Jimmy Cobb, Ryan Kisor, Etta Jones, Peter Bernstein, Eddie Henderson, Eric Alexander, Walt Weiskopf and Jon Hendricks, among many others. His eleven albums as a leader, including his latest recording, Standards, have earned consistent praise from publications such as DownBeat, JazzTimes, Financial Times, Jazz Journal, and the New York Times. As a composer, his awards include a $10,000 jazz chamber music commission from the Doris Duke Foundation, which he performed both at Smoke Jazz Club and the Jazz Gallery in New York, with drummer Al Foster, and bassist Paul Gill. He has performed with various groups at every major jazz venue in New York City, including the Village Vanguard, the Blue Note, Smoke, and the Jazz Standard; his current trio performs in New York, around the U.S. and at festivals and concerts internationally. He has been teaching at the New School since 1995. Essiet Okon Essiet first received critical acclaim more than a decade ago as a member of saxophonist Bobby Watson's post-hard bop group Horizon. He has long since established himself as one of New York's premier bassist. He began is musical studies on the violin at age 10, then switched to bass four years later and began studying jazz. Having traveled widely as a youngster with his family, originally from Nigeria, he had an easy time adjusting to life on the road once he turned professional. His early exposure to many cultures, languages, folkways, and religions fostered his worldview of strength through diversity. "Some musicians are purist" says Essiet, "but I like to mix styles. I like many different types of cultures." His first big break came in 1982 when he met Chicago based percussionist Famoudou Don Moye, a founding member of the Art Ensemble of Chicago and The Leaders, who asked Essiet to join his quartet. During that same year the bassist met Abdullah Ibrahim, the famed South African pianist. Sylvia is an active drummer on the New York music scene contributing outstanding performances in a variety of situations. She has had the honor of sharing the bandstand with saxophone legend Joe Henderson for 4 years. They toured extensively in Europe, Asia and U.S. Sylvia also performed with trumpet legend Clark Terry for 17 years. Terry’s quintet and big band performed jazz cruises, clubs, concerts and festivals in the U.S. Europe, the Caribbean, and South America. She recently performed with Kevin Mahogany in South Africa and toured as a leader in India.